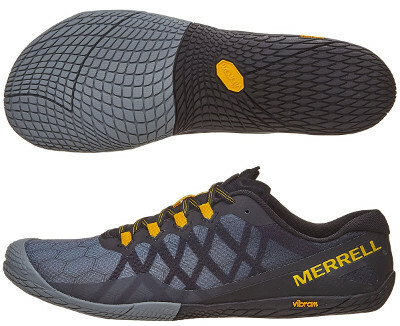 Merrell Vapor Glove 3 are neutral minimalist running shoes. The Merrell Vapor Glove 3 is the third update among minimalist catalogue from american brand to reach the market in 2017 after Trail Glove 4 and more versatile Bare Access Flex. Although materials (everything is synthetic so vegan friendly as usual from Merrell) have been upgraded together with some reinforcements to overcome upper durability issues, the Vapor Glove 3 remains true to its radical minimalist spirit for more demanding runners with great technique for natural ride with full ground contact. There is not much room to change outlook from successful predecessor Vapor Glove 2 but fused TPU overlays strength the breathable mesh to mitigate wear in more frictioned areas. Most eyelets are actually straps which provide secure and snug fit using the pressure from traditional and flat lacing system. As expected, the Vapor Glove 3 is sockless friendly not only because of seamless soft feel but also because both breathable mesh lining and integrated footbed are treated with M Select™ FRESH to reduce shoe odour for healthier foot environment and better comfort. Regarding outsole (again made in collaboration with renowned manufacturer Vibram®), there is no significant change in lug pattern but it is slightly thicker and rubber has been upgraded from TC1 to TC5+ to improve grip and traction on roads.